Oh noes, another nail collection post! I just got an email from Color Club about a new collection, so I thought I'd show you the promo pictures. It looks like we'll be getting a softer, springtime taupe creme, some delicate pastels and some eye catching indigos! What's that on the end, an eggplant purple? Yes please! The only thing I'm apprehensive about is that dark Snakeskin looking polish in the middle (remember Snakeskin and how I didn't like the finish? ), but maybe it'll be like Snakeskin, minus the bumps. 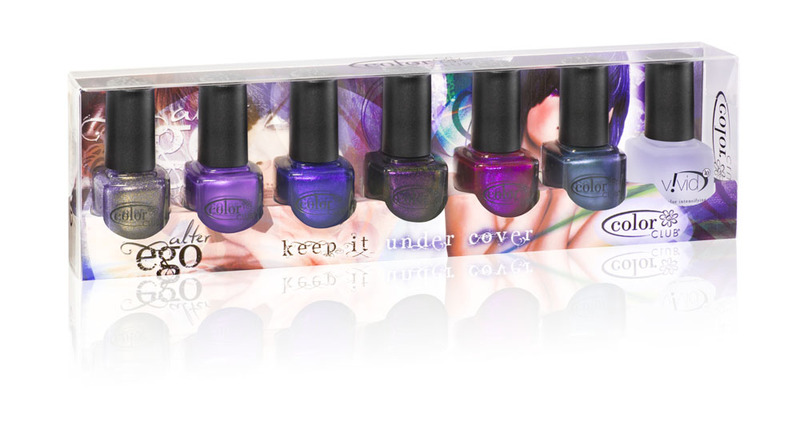 their latest collection of diverse, long-lasting lacquers! rendezvous in full view with our sheers of Alter Ego ‘LIGHTS’ and ‘DARKS’! Ulterior Motive and Masquerading plus Vivid Top Coat. Mmmm, count me in! I'm especially fond of purples, I have more violet polishes than any other in my collection so I'm quite excited for the dark half of this collection. What do you think? Do you spot any polishes you know you need to have?